The last day of May. I can’t believe it. I also can’t believe I got too busy to do a list last week. Oh well — here we go! How precious is this picture of Romeo? Seriously. Having a date night in, complete with mini deep dish pizzas, ice cream, and Netflix. Watching random documentaries about bizarre people. Spending a day to finally (!!!) put our house together (for the most part). Washing all of Dax’s clothes, only to get gifted two more boxes worth! Relaxation exercises at our childbirth class. Spending a Sunday morning at home with the handsome fellow you see pictured above. Getting to see Jessica while she’s in town! Homemade strawberry pie. Oh. Em. Gee. Bison burgers and half sours from Ted’s with awesome people! 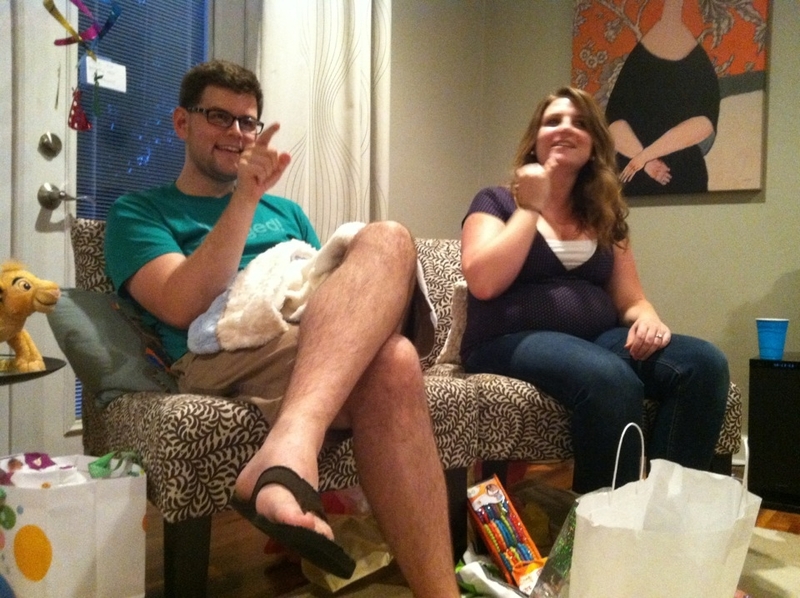 Getting to shower Ashley and Baby Jack, who will be here so SOON! YAY! Having a FOR REAL conversation with Kylin. That kid is smarter than me, I think. Having Nora come over and help me organize the apartment. Feeling sweet baby Dax move all the time and, of course, getting to hear his heartbeat! Finding out about more pregnant friends! Baking cookies. Like, for real though! Not break-and-bakes! REAL COOKIES! My bestie got a new truck! That’s fun! We also get to hang out tonight which is awesome! My life rules! What do you love? There has been a word that has been echoing throughout my life lately. And that word is enough. I’m slowly but surely plugging through Jon Acuff‘s book Quitter: Closing the Gap Between Your Day Job & Your Dream Job and I came across a section yesterday that really resonated with me — defining your “enough”. Switching gears completely, I know I have been uncharacteristically quiet about it so far, but the Time Magazine cover heard round the world also bears this word. Am I mom enough? Jeez, I guess not, since I don’t plan on continuing to breastfeed my kid when he’s tall enough to reach the microwave. This “enough” has been unmistakably evident in my life as of late. Am I working enough? Am I making enough money to afford to be a good mother? Is my apartment safe enough? Does my husband love me and our son enough to never leave us? Am I volunteering enough? Am I praying enough? With a baby on the way and a seemingly unending laundry list of things to be worried about, I’ve officially given up. There is only so much I can do or be. When is being “enough”… well… enough? And so, I’ve decided to take a page out of Jon Acuff’s book and define my own enough in a letter to Future Me, with the hope that I’ll refer back to it when I don’t feel enough. At this moment in time, you’re probably in your cubicle at work, trying hard to focus on the task at hand, but finding yourself distracted by several things: the guilt that comes along with the fact that you’re not at home with your son; the fact that whomever is home with him is probably surrounded by the rest of the things you’re worried about; dirty diapers, dirty dishes, piles of laundry, and a litter box that is screaming to be emptied. You’re more than likely stressed out about the fact that you’re not entirely sure how you’re going to afford to feed your family something healthy this week, either. How many times a week can you have pizza before Congress decides it’s not a vegetable anymore? Take a deep breath. Relax. Remember that you are doing everything you can. You are doing enough. You are enough. You have a husband who loves you and takes care of you and your baby. You have a job; even if that job doesn’t pay much, it does allow for you, your husband, and your son to have health insurance. You are part of a wonderful church community that loves you and cherishes your involvement. You are surrounded by countless friends and family who not only know everything about you, but love you regardless and want the best for you. You live in a safe neighborhood. And even if you don’t know the first thing about decorating, your house has character. Even when it’s messy. You gave birth to a beautiful baby boy who clings to you in a way that no one else can experience. You are his source of life and sustenance. And even when he grows up to be a teenager and hate you, you’ll still be his Mommy. You’ll still be enough. Above all of that, you have a God who loves you enough to die for you. He will never forsake you or leave you, even when you’re too tired to put away the laundry or vacuum or load the dishwasher. This is enough. You have enough. Remember that. P.S. Don’t worry about losing the baby weight. Seriously. Your husband will probably become inconsolable if you go back down to your original bra size anyway. Just embrace it. P.S.S. Don’t eat the entire strawberry pie in the fridge. Sure it’s delicious but your stomach is going to haaaate you. P.S.S.S. Has Michelle Obama found your blog and asked you over for dinner yet? Just curious. I’m not known for taking the time to weigh out all the consequences of my decisions. I’m typically of the mindset of hey, why the hell not? versus give me a while to process it and I’ll get back to you with a sound and well thought out plan. People will read it. And they will know these terrible things about you. But that’s okay, because everyone who reads your blog already knows everything about you. Yeah. I guess you’re right. Alright. Let’s do it. So I texted him back with an affirmative. As usual, there were some heavy consequences I did not take into consideration, mainly the fact that it would be on Eric’s blog, not mine, and, therefore, read by his readers and not necessarily just mine. Do you know who reads Eric’s blog? I sure do now — at least half the congregation of our 500+ person church, for which my husband works, for one. I had a handful of people, some I knew and some I didn’t, come up to me and tell me how influential that post was. Not because I’m a phenomenal writer or anything (though if anyone wishes to come forward with that sentiment I’ll most certainly accept) but because it shattered their perceptions of me. At that moment their eyes were opened, and they suddenly felt shame at their nakedness. So they sewed fig leaves together to cover themselves. Though God knew Adam and Eve completely, they were ashamed to be seen because of their brokenness. That’s how I felt about everyone who read the blog post. Suddenly, even people who didn’t know me now knew my brokenness. And people are a lot less forgiving than God is. Believe it or not, that wasn’t the worst of it for me. The most shattered, naked, and ashamed I ever felt was actually a couple of years ago. Ironically, it was in front of the same guy who asked me to write about growth on his blog. Not the most uplifting conversation to have over my lunch hour, even when accompanied by endless cheddar bay biscuits. The rest of the lunch was awkward and painful because I couldn’t stop crying. I was so naked. So exposed. So ashamed of everything about me. Every time the waitress came by and refilled my water I had to pretend my face wasn’t red and stained with streaks of black mascara. I’m not sure she bought it. The great thing about these situations, both the blog and the Lunch That Will Forever Remain in Infamy, is that neither time was I met with a negative reaction. At Red Lobster, Eric was unbelievably graceful (even though he probably felt ten times as awkward and weird as I did) and, concerning the blog, everyone who read it was really supportive and, more often than not, had actually experienced similar things. Many people said that they felt relief and safety and grace because of the vulnerability of my writing. The way I see it, no one has ever gotten anywhere by pretending to be perfect. If anything, we just get farther and farther away from the beauty of grace and redemption that we were created to experience. By pretending we don’t need grace, we never truly learn how to give or receive it. And that, I believe, is one of the biggest falls mankind can experience in this life on earth. Whatever it is that has “broken” you, or made you “ashamed,” know that grace is real. And you can’t receive it until you realize that you oh-so-desperately need it. And that might mean shattering some perceptions of yourself. Maybe to others. But mostly to you. 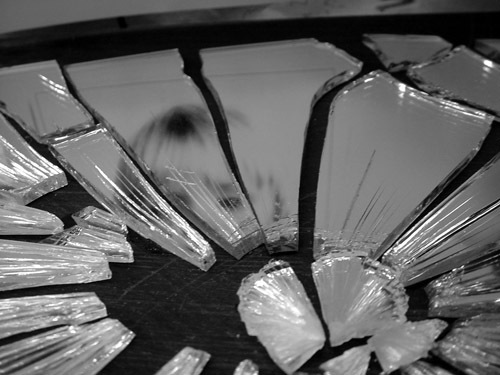 What perceptions of yourself do you need to shatter? Happy Thursday! Even though we have yet to see a day without rain here, life is pretty great. Besides, the constant rain is just an indicator of just how close we are to summer. Hooray! Here’s this week’s list of love! BEING RETWEETED BY JARS OF CLAY. Having so many friends willing to help! Ice cream with friends at Lofty Pursuits. Publix, where shopping is SERIOUSLY a pleasure. Having the tables be turned on me when Dan stayed out with our friends and I went home to crash. Being able to lead worship with close friends. My first Mother’s Day, and all the flowers and cards I got! Staying up with me when I couldn’t sleep. Heating up pizza for me in the middle of the night USING THE OVEN because we were without a microwave. Letting me nap in the afternoon while he organized the kitchen, despite being probably just as tired as me. Watching Dan on the phone with Comcast. Oh. My. Goodness. So much hilarity. Deciding that if Comcast is our only option at our new place, we will go without TV and just have Netflix streaming and Hulu Plus. He hates Comcast THAT MUCH. Having Nora over for dinner and organization. Hearing my little man’s heartbeat again. Going over to the Machnics’ for dinner and fun conversation! Waking up in the morning literally spooning Hamlet, aka the cuddliest cat ever. How’d he manage that? 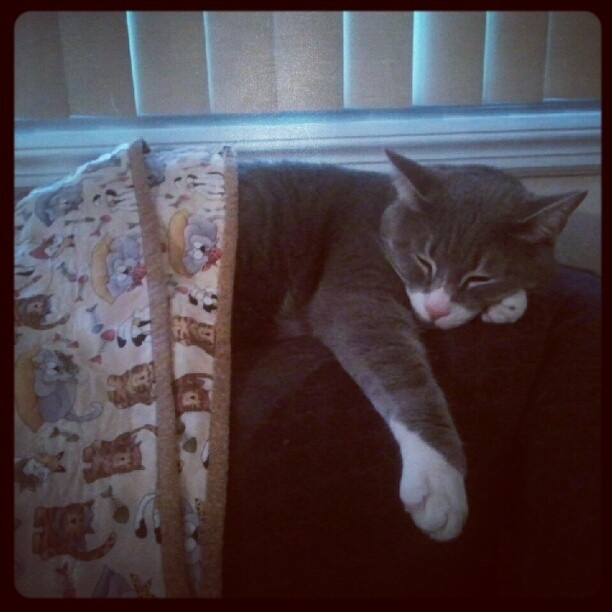 Sleeping peacefully despite my husband being gone. The fact that my husband will be back today! And hopefully won’t bring any reggae dancing with him! That’s all for me. What do you love this week? guest post: WOW wednesday on m2hf. All throughout the month of May, my good friend Lindsey is asking “Women of Wisdom” to write guest posts on her blog each Wednesday. I’m honored to be one of the people she asked to contribute. Today, my post is up on her blog. Even though I’m only 26, I’ve already had to live through some pretty intense stuff: growing up with an absentee father, suffering from an eating disorder, being treated for mental illness… But, I think, the hardest piece of life I ever had to live was two and a half years of an abusive relationship. I couldn’t get out of it because I was afraid I’d get even more hurt than I already was on a daily basis. So I stayed. And it was awful. Click here to read the rest of the post. And don’t forget to check out the rest of her blog as well! A little over a week ago, I went with my husband on opening night to see The Avengers. Despite not giving two craps about the comic books, or the characters therein, I still thoroughly enjoyed the film. The writing was punchy and smart, and, for those of us who have no back story to go on, it was easy to follow. Partner that with phenomenal special effects and a conceited yet endearing Robert Downey Jr. spouting off one quip after another? Magnifique. Is he looking at her? Does he still think she’s hotter than me? Of course he still thinks she’s hotter than me! She IS hotter than me! She’s Scarlett F—ing Johansson! And I’m a big, chubby pregnant slob! I’m pretty sure angels sing when she wakes up in the morning. Angels who, undoubtedly, have pictures of Scarlett hanging on their walls. Angels do not have pictures of me hanging on their walls. If they do, it’s only as a visual reminder for them to talk to God about arranging my appearance on TLC’S “What Not to Wear.” You know… as a favor to me. You’d think it would be easy for me to hate Scarlett because of all of this. Wish she never existed and all that. But the truth of the matter is, I think she’s just as bloody beautiful as everyone else on the planet thinks she is. And, today, she proved to me that she’s more than just a knock out. Damnit, you guys. Scarlett’s sharp. She’s intelligent, a self-proclaimed body image warrior, and a fantastic writer to boot. Touche, Johansson. Tou-freaking-che. You are a superhero, aren’t you? How can I ever measure up? Since dedicating myself to getting into “superhero shape,” several articles regarding my weight have been brought to my attention. Claims have been made that I’ve been on a strict workout routine regulated by co-stars, whipped into shape by trainers I’ve never met, eating sprouted grains I can’t pronounce and ultimately losing 14 pounds off my 5’3″ frame. Losing 14 pounds out of necessity in order to live a healthier life is a huge victory. I’m a petite person to begin with, so the idea of my losing this amount of weight is utter lunacy. If I were to lose 14 pounds, I’d have to part with both arms. And a foot. I’m frustrated with the irresponsibility of tabloid media who sell the public ideas about what we should look like and how we should get there. brb changing career path to become scarlett johansson when i grow up kthx. Happy Thursday! And, because I haven’t said it yet, happy May! I hope you’ve all had a great week. Mine has been filled with blessings. So let’s get right to it! Not one, but TWO baby showers! If the amount of loot we procured is any indication, our little Dax is already so loved (and spoiled rotten)! Seeing a bunch of friends and family from out of town who drove 4 hours for my shower. Wow. So awesome! TINY BABY THINGS. Especially things with ears and/or pointy heads, footies, and embroidered things sewn on the butts. FINDING A NEW PLACE TO LIVE! And it’s so cute. I can’t wait to take pictures and show you. We move in this weekend! Writing in coffee shops, especially coffee shops at which my friends are employed. The Avengers. Holy crap, you guys. I can’t imagine how good it must have been for the people who actually give a darn about the comic books because I LOVED IT. Robert Downey Jr. I mean, seriously. Cinco de Mayo bible study and party. Virgin margaritas that actually tasted good. You know, food in general. CATS. Especially mine and tiny ones with sorta-broken tails. Actually using Pinterest for wedding planning. Going to church with Mom. Deep thoughts and conversations with friends via email. Getting much wanted and needed birth/child rearing advice from good, wise momma friends. Sleepy and snuggly baby Isaiah. “Hey Lindsay… Isn’t cool how I knew it was you without looking?” – Levi is the best. That’s it for me. What do you love this week?